※ Power Consumption: Approx. 2.5mA. ※ Response Speed: 2.5 Times/Sec. Digital Light Meter -- 3 1/2 (1999 Counts) LCD Display. 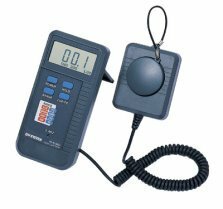 The GLX-301 digital light meter is a hand-held device ideal for on-site measurement of light quality. In addition to the 270g lightweight , two measurement units, Foot-Candle (fc) for Imperial system, and lux for metric system, ensure operation is available anywhere. A separate light sensor for optimum position measurement enhances measurement sensitivity. Background task support as in data hold function, low battery indicator, and offset adjustment, lets users focus on the applications rather than device configuration. Battery 9V NEDA 1604, IEC 6F22, JIS 006P.